Added on June 10, 2018 by Claire Wellesley-Smith. It has been over 5 years since I began my stitch journal an (almost) daily stitching project. Writing about it in 2013 I described it has having 'No rules, no projected outcome. A record of days, but not a daily record.' I also wrote about it in my book as part of an exploration of textiles as a daily practice. Over the years I've continued to stitch, sometimes adding new sections of cloth, sometimes overstitching previously worked areas. My favoured threads are still the ones I dye myself, another way of making a personal place-based connection to the cloth. The cloth as a whole piece is now over two metres long, no longer the portable project it was when I began. On days when I've been evaluating projects, writing funding bids, sitting in meetings and all the other administrative tasks that go into arts project management, I find the simple act of choosing thread and beginning to stitch very restorative. 2018 has been busy for me with two long-term socially-engaged art projects I coordinate, Local Colour and Worn Stories: Material and Memory in Bradford 1880-2015. This means that I have less time for my own making practice than I would like. However, I am using both projects as fieldwork for my doctoral research project with the Open University. My research is about engagement with textile heritage and asks whether involvement in slow textile projects can craft resilience in post-industrial former textile communities. Alongside my PhD project I have begun a new section of my stitch journal and I am using it as a creative method to chart my research and allow myself a different way of thinking about it. I find that these wandering stitches are helping to embed my thinking as I work, a way of thinking-through-making. I am planning to continue to chart the course of my studies this way, using my stitch journal as an ‘embodied and open-ended investigation’ (Kwon, 2013, p. 30). I regularly post images of my stitch journal in progress on my instagram account alongside updates from my other projects. It is also very inspiring to see other examples of textile journals and daily textile practice there. Added on May 2, 2018 by Claire Wellesley-Smith. In 2016 and 2017 I was involved in a collaborative project with my friend and fellow artist Hannah Lamb called Lasting Impressions. The project was commissioned by Saltaire Inspired for Saltaire Arts Trail. Working in the former spinning room at Salts Mill we created a performative and participatory work which aimed to create a record of the clothes worn by arts trail visitors. Working with materials including porcelain and fibre the project began many conversations-through-making with those who participated in the work. This year we have collated our responses to and images of the work in a publication. Lasting Impressions will be launched at this years' Saltaire Arts Trail, 5th - 7th May at Hannah's studio. We will be based at the Butterfly Rooms, Gordon Terrace and will be exhibiting some of the work made during the project. Added on September 9, 2017 by Claire Wellesley-Smith. One-hundred years ago today, 3000 women marched for peace in central Bradford, a demonstration against the ongoing carnage of the war. I have spent some time this year researching and making work for an exhibition that commemorates this event. Other than these press reports little archive material exists about either the BWHL or the September 1917 protest march. I noticed a blue plaque outside the old textile hall on Westgate in the city centre and was intrigued by the story. My interest was amplified by the centenary commemorations of the First World War and more recently the grassroots activism of millions of women who marched in January 2017, shortly after the inauguration of Donald Trump. The work exhibited in this exhibition is an invocation of the 1917 march, as reimagined by myself. I have used found material from a route that takes in areas of Goitside and the bottom of Thornton Road, now brownfield sites. This material includes textile scraps, plant material turned into textile dyes, found metals used as resist prints. Embedded in each textile are hundreds of running stitches using old silk thread from Listers Mill. I was minded of the repetitious processes of the industries the women kept going during the war: munitions work, weaving cloth for military uniforms. My stitches produce their own rhythm, much like walking, each stitch offering a mark of resistance. Resist is at Bradford Cathedral Artspace 30th September - 28 October 2017. I will be giving a talk about the work on Friday 6th October at 7pm at the cathedral, all are welcome. Added on May 26, 2017 by Claire Wellesley-Smith. In 2016 Hannah Lamb and myself presented a commissioned work for Saltaire Arts Trail based in the Spinning Room in Salts Mill, once the largest industrial space in the world. Lasting Impressions was a performative and participatory artwork that aimed to create an archive of the cloth we carry with us all the time; the clothing we wear day-to-day. Over three days we collected impressions of over 300 participants' clothing on porcelain tiles and their responses to the item in writing. During Saltaire Arts Trail this weekend will be archiving these responses and creating new work using fibre. The project will be asking participants to engage with fibre in familiar and unfamiliar ways; encourage people to discuss common material language and bring new audiences to engage with contemporary archival art practices. We will be in the Spinning Room, Salts Mill on Saturday 27th, Sunday 28th and Monday 29th May. Performance times are 11-12pm , 1-2pm and 3-4pm each day. All are welcome. Added on March 31, 2017 by Claire Wellesley-Smith. I've recently started work on a new project for Hive, a community arts charity based here in Bradford. “Worn Stories” is a two year project that will explore the heritage of textile reuse and second hand textiles in Bradford from 1880-2015. It is funded by the Heritage Lottery Fund. The project will link past and present, identifying, interpreting and recording personal and community memories of arrival and belonging through stories of cloth. I'll be working with diverse groups from across the community who will develop research skills, learn about heritage through engagement in dedicated learning programmes within their own communities and share skills and experiences with others around the city. The project will reference the Bradford Heritage Recording Unit interviews of textile workers collected in the 1980s. I'm hoping that the project will offer an opportunity to have conversations about community ownership of textile recycling and reuse in the city and that this might have longer term impacts in reducing textile waste. We'll be encouraging interaction between communities and offering ongoing opportunities to relate the heritage of recycling to modern day practices. The community and volunteer led research from this project will result in the production of creative interpretive work for permanent display, digital online resources and a network of local textile recycling hubs for use in other communities and projects. Towards the end of the project we'll be having a conference that addresses some of the themes and will offer an opportunity for the communities involved to showcase some of their work. There is a project blog that will record the progress of the project as it develops if you are interested in finding out more. :: this project and my current residency are keeping me very busy. However, Hannah Lamb and I have been working towards the second stage of our Lasting Impressions project and this will be exhibited in the Spinning Room in Salts Mill as part of Saltaire Arts Trail this May. There will be another opportunity to see the work when it is exhibited in The Dye House Gallery, Bradford in July. I'll post more information about this soon. Added on December 19, 2016 by Claire Wellesley-Smith. I am currently at the start of an eight month residency, ‘Local Colour’, based in Accrington, Lancashire, commissioned by Super Slow Way. This is a new commissioning body funded through Arts Council England as part of their Creative People and Places funding stream. It is hosted by the Canal and River Trust. A programme of work with local, national and international artists is being delivered in a series of commissioned and community-based residencies focussed on the bicentenary of the Leeds and Liverpool Canal. ‘Local Colour’ is based at Elmfield Hall (c.1853) the former home of a textile industrialist, Albert Gatty, who specialised in Turkey Red print and dye techniques and who later became an innovator in the creation of a mineral khaki dye for use in army uniforms. The house is now the base of a social enterprise, Community Solutions North West, an organisation specialising in community engagement and support for vulnerable adults. Pictured (top left) is the interior of a small private dye house that Gatty had built next to his house where he could conduct his experiments. It has been virtually untouched since the late nineteenth century. The project proposes to use a slow methodology to explore historical connections to the area around Elmfield Hall using ‘whole process’ working: seed-to-fabric projects where participants engage in activities that have a localised approach. The focus will partly be around the use of madder in Turkey Red printing. In the context of this durational project the creative processes of talking and making, or conversations through making, will be used to explore Elmfield Hall and its environs. In my proposal for the residency I quoted Lucy Lippard who describes ‘…a layered location replete with human histories and memories, place has width as well as depth. It’s about connections, what surrounds it, what formed it, what happened there, what will happen there.’ (2007, p.7). I'll report back on our progress as the project develops. :: My engagement with this blog has been sporadic to say the least in 2016. It's been a very busy year for me and has included some big changes and challenges. I'm planning to write another blog post soon with some information about a new long term project, my PhD research, an update about Lasting Impressions and workshop and exhibition news. Many thanks for continuing to support my work, for reading my book and for visiting my Instagram feed this year. It is very much appreciated. Added on April 18, 2016 by Claire Wellesley-Smith. I'm delighted to be involved in this year's Saltaire Arts Trail, where I will be working with Hannah Lamb on a new performance work called Lasting Impressions. Aiming to provoke conversations about the value of cloth and clothing, we will be collecting an archive of Arts Trail visitors' clothing as impressions in porcelain. Visitors will be invited to emboss porcelain tiles with textures from their clothing, an edge of a dress, the corner of a cuff, a coat zip... In exchange for leaving a mark from their clothing, each person will be offered the chance to have a gold or silver stitch added to their clothes. Salts Mill is a former textile mill in Saltaire, just a few miles from the centre of Bradford, West Yorkshire. When it was built in 1853 it was the largest factory in the world. Lasting Impressions will take place in the Spinning Room in the roof space of the mill, a space not normally open to the public. The room is 168m long and once contained 16,380 cap spindles for spinning yarn. 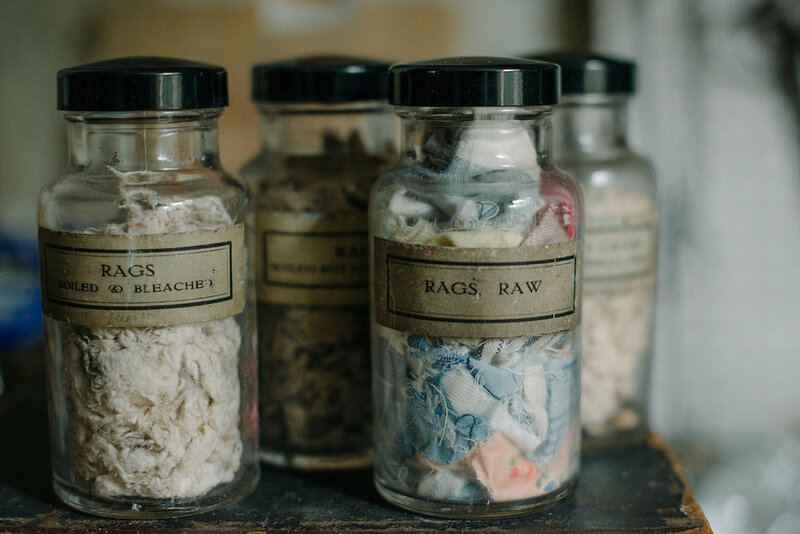 Whilst many visitors to Salts Mill will be well aware of the mill’s textile heritage, how many make the connection to the clothes they wear day-to-day? This project asks us to consider the cloth we carry with us all the time; Where does it come from? Where will it go? What impression will it leave on our own lives? What mark will it leave on the world? Lasting Impressions takes place as part of Saltaire Arts Trail from 28th to 30th May 2016 and is supported by Arts Council England. Saltaire Arts Trail presents contemporary craft and visual arts in houses and historic venues around Saltaire village, a UNESCO World Heritage site. For further deals about the performances including times, and about other events during the Arts Trail please visit the website. Added on December 4, 2015 by Claire Wellesley-Smith. I've listed some workshops for 2016 on my big cartel site here. These will be held at my home-based studio near Bradford, West Yorkshire. I'm starting the year with a Slow Stitch day, and in March and May will be running two day sessions for the first time, featuring dyeing and stitching. For more information and to book please visit here. :: The above image shows some stitch on indigo. The colour is from my small henna-based vat (I keep it in an old spaghetti jar). I've been mordanting my fabric before dyeing to get darker tones and finding the results are very pleasing. The two day workshops advertised above will include this technique. :: Signed copies of Slow Stitch are now available here. The book is reviewed in the November/December issue of Embroidery, on the Textile Artist website and in the Winter edition of UK Handmade magazine. Thank you so much to all those who have purchased a copy and who have sent me so many positive messages about it.